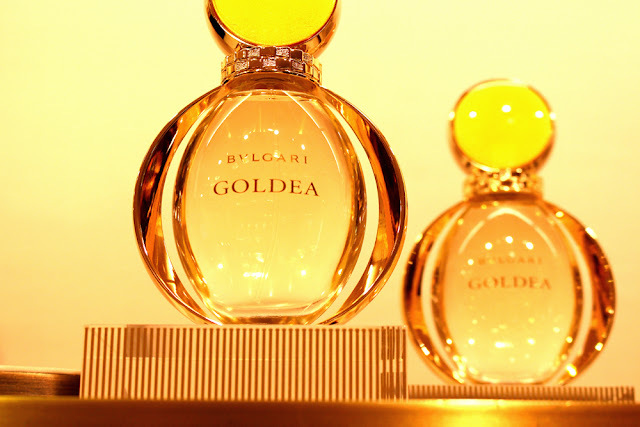 Inspired by the bright yellow gold Bulgari has treasured for over 130 years and its mythical place in history, adored by the Egyptians, the Romans and goddesses (the Latin for which is Dea, hence the name) like Cleopatra, Goldea is a bold floral-oriental featuring soft white musks, sensual amber and floral sensations. In its pure form, natural musk is precious - five times more expensive than gold - and Goldea is a celebration of it with musk in the heart, head and the base. If musky fragrances are your thing, you're in for a heady, addictive treat. It opens with crystal musk lightened with orange blossom, bergamot and raspberry. In the heart there's floral nectar, notes of exotic ylang-ylang and jasmine and the base features the velvety Royal Albert musk, an amber blend, golden patchouli and Egyptian papyrus. It's intense yet modern and wears well as it warms beautifully, leaving you with sweet, sun-kissed skin. It comes in a luminous polished bottle featuring a gold ring around the neck reminiscent of the snake motif from the iconic Serpenti range. Isabeli Fontana fronts the TV and print campaign shot by Mert Alas and Marcus Piggott and it's out in stores now. What's your new favourite perfume?